For almost 2 months you've heard me hint about "that roses piece" or "the Mackintosh piece" I've been working on. I've shared a bit of the process, and snips of photos of it under construction. I'm pleased to announce that -- it's finally finished! 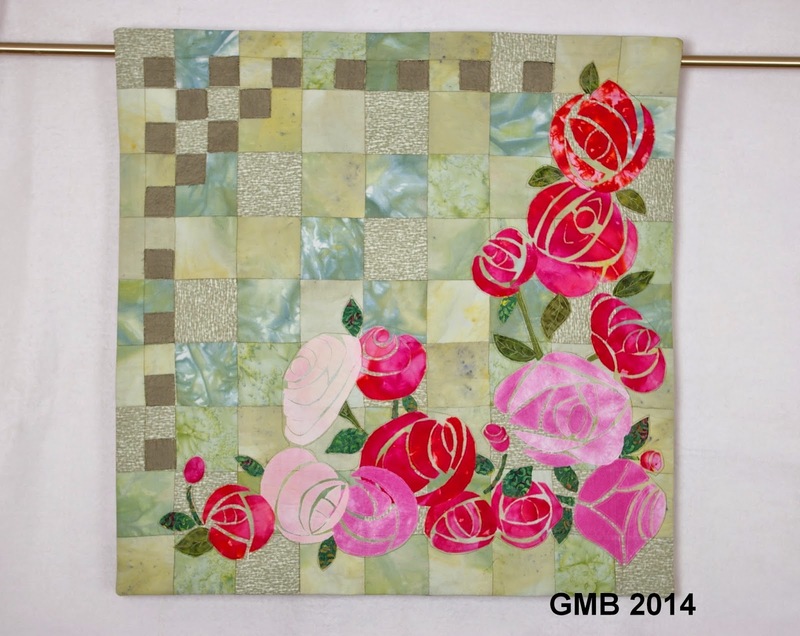 AND this morning -- just a few moments ago, in fact -- I entered the piece in "Coming Up Roses", one of the "Quilt! Knit! Stitch!" (R) Calls for Entry, about which I received an e-mail 'way back in January. This is the most major juried event I've ever entered. It carries the possibility of "Houston" with it. Maybe...or not. But I was captivated -- definitely captivated -- by the theme and by the fact that I at last felt I could work in the minimum size required -- 25" x 25" (thanks to my Fifteen by Fifteen group!). 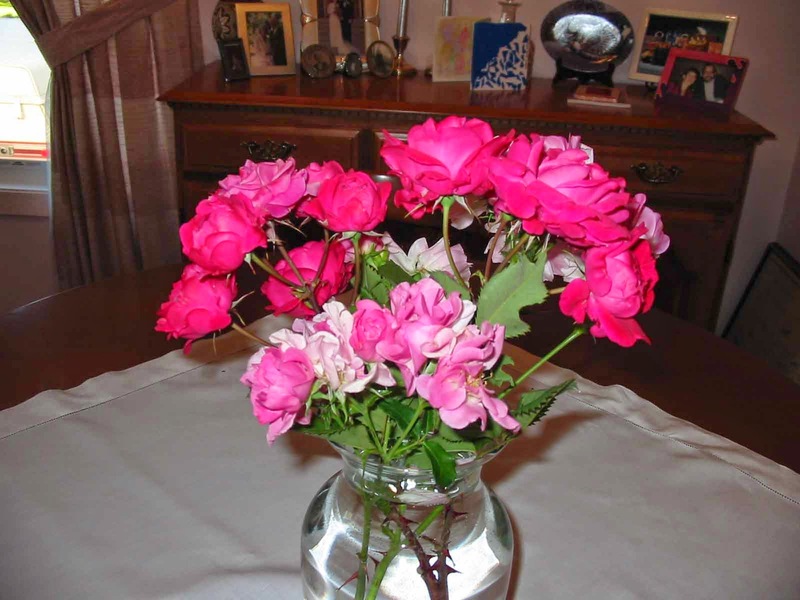 For some time now I've longed to do something with the motif of the Glasgow Rose, made popular by Charles Rennie Mackintosh (1868-1928) and, well, I dug out a photo of a bouquet from the garden I had in Calgary (my roses here in Mirror are still finding their feet, as it were)...and the rest is history. Last night a photographer came to shoot the finished quilt, and the process was complete. The photos were in my e-mail this morning. I saved copies with the required naming convention, completed the on-line application and pressed "SUBMIT". Then I began to breathe again (grin). The entry deadline for this Call is May 2, 2014, and entrants will be notified by June 6th. Selected pieces have to arrive in Houston by July 8th, for the opening in Portland, OR, in mid-August. Pieces could travel until July 2015. Say a wee prayer; send 'good vibes'; wish me luck -- whatever! You'll be the first to know! How exciting! I think your roses are just wonderful and Houston-worthy for sure. Best of luck! ooh, I can almost smell it. The scent of a winner for sure! Looks really good, Margaret...good luck! It looks wonderful! Love the design and colors. Good luck. HOUSTON here I come! I love the finished piece. Good luck with the entry. I even have my toes crossed, not that you'll need it, but it doesn't hurt to wish extra hard. The quilt is stunning. Good luck and I'll be waiting to hear your news. It is a beauty, Margaret.... wishing you luck with the entry!